##Firebase is a PaaS for building mobile and web applications. It provides a realtime JSON database for storing and sync your app’s data. Let’s explore how Backbone can seamlessly integrate with Firebase, making clients applications syncing effortless. The application architecture is composed of a model, a collection and a view. The color model is just a stripped Backbone.Model. This will serve as a constructor to later instantiate all of our colors. Here is where all the action will happen. Our application will allow us to add colors to a colors collection. The collection will act similarly to a stack: we’ll be adding colors on top of the stack and removing from the top of it, following a FILO (First In Last Out) approach. Inside the view we defined the template logic together with its rendering. For the sake of this post, we used a simple underscore template and some jquery to handle the rendering. In an events hash we specify a set of DOM events that we will bound to relative methods (addColor, removeColor and resetColors). On initialization, when our view will be instantiated, we set up a listener to listen on add, remove and reset events on our collection, triggering the render method when they fire. Our methods operate on the backbone collection. addColor() will instantiate a color using the Color model as a constructor. We’ll rely on the pleasejs library to generate random colors storing the hexadecimal values as the Color.hexColor property. removeColor() will just pop a color from the collection, while resetColors() will reset the whole collection. ###Dependencies First, let’s add the right dependencies and load the firebase and backbonefire js libraries in our index.html. Guess what? We are done, refresh your app and Boom, our Backbone collection is now synced in RT among all the clients running and your Firebase database. Neat! Be aware that a Backbone.Firebase.Model should not be used with a Backbone.Firebase.Collection. Use a regular Backbone.Model with a Backbone.Firebase.Collection instead. Personally I really like Backbone, its way of of MVCing, and its unopinionated approach. 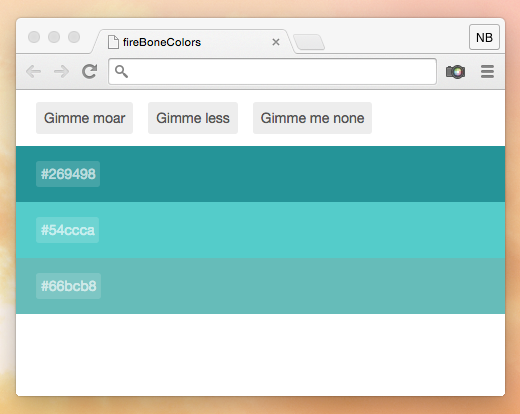 Binding with Firebase just opens up endless possibilities.